If the whole series had gone the way the , Pakistan wouldn't quite have minded, even if the scoreline had been the 4-0 it currently is in favour of Australia. For the first time in the series, the purpose of Pakistan playing their bench strength finally bore fruit with scoring 112 on debut; no one has managed more for Pakistan in their first game. The reserve wicketkeeper Mohammad Rizwan scored his second hundred in three games, making a strong case for a ticket to England on the strength of his batting alone. Yes, somewhat impossibly, Pakistan ended up seven runs short of a win, but for the first time in the series, coach Mickey Arthur can claim with some credibility there is a bigger picture to be taken into account. Pakistan were docked ten percent of their match fees for a slow over-rate in the fourth ODI in Dubai. Imad Wasim, standing in as captain for the injured Shoaib Malik, was fined 20 percent as is customary. The ICC announced the match referee Jeff Crowe had imposed the punishment as Pakistan bowled the final over after the time set for the innings had lapsed. \"Imad pleaded guilty to the offence after the end of the match and accepted the proposed sanction, so there was no need for a formal hearing,\" the ICC said. Pakistan lost the game by six runs. Abid Ali's nerveless hundred sees him rocket up the pecking order, guaranteed to start more than just the final game of the series. A whitewash, however, is no great preparation for anything, and with Pakistan's ODI record against the teams they face at the World Cup especially abject over the past 15 months, they will be desperate for a victory to close out this series. The chase, though ultimately botched, will give Pakistan confidence they can compete with Australia. But for that, they continue to search for consistency in the top order, with the performances in the fourth ODI very much the exception rather than the rule. Australia can't put a foot wrong right now. 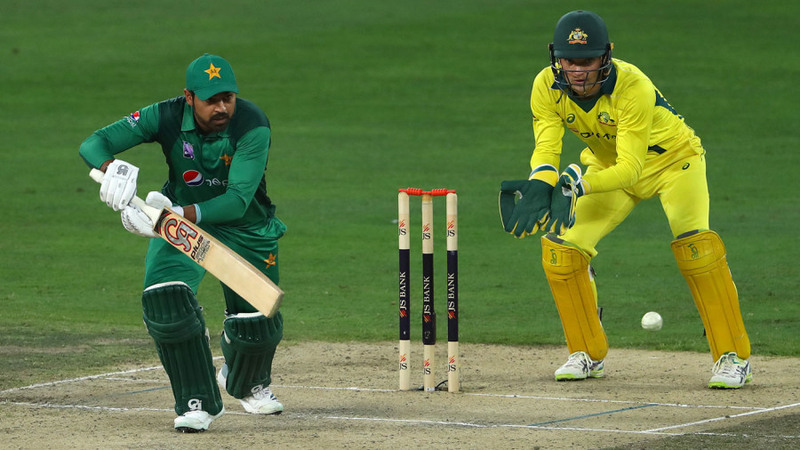 The improbable win in Dubai was their seventh in a row, and, lest we get too caught up in the players Pakistan have benched, take some time to ponder how much further this Australian side can be strengthened. Pat Cummins played just one of four ODIs, with Mitchell Starc, Josh Hazlewood, Steven Smith and David Warner all likely inclusions to the World Cup squad. Without all that glamour, they swept aside Pakistan in the first three games, before demonstrating their steel to grind out a hard win in the fourth. This is the highest level at which Australia have played ODI cricket since they won the 2015 World Cup, and they could not have chosen the timing of their purple patch better. It is an undeniable fact Pakistan will leave out from the World Cup squad a number of bowlers other sides would cherish. Two of those most likely competing for one place are Usman Shinwari and Junaid Khan. Shinwari was Pakistan's best bowler in the third ODI before tailing off in the fourth - somewhat the story of his blossoming career so far. Junaid was more probing in the fourth game than in the third, but the pair needs to show more evidence of consistent quality to earn a place in the most hotly competitive portion of the squad. World Cups define careers, particularly in Pakistan cricket, and should the pair take to the field in the final game, both left-arm pacers will have that extra bit of motivation to push their case. In the short term, that should boost Pakistan's chances of coming away without a whitewash. The numbers look flashy for most Australians this series, but one whom they arguably short-change has been . The offspinner has managed one wicket in each of the four games while going at five an over, except in the second ODI. But those who watched him bowl will be surprised he hasn't been more successful. The ball has spun for him more than his legspinning counterpart , and Lyon has looked likely on a number of occasions without the results to show for it. The wickets he's taken for his side have all been important batsman at crucial moments, but time is running out for him to impress the selectors enough for a World Cup berth. Pakistan may persist with the same side that gave Australia their sternest test of the series, depending on whether Shoaib Malik is fit again to take over the reins. In that case, Umar Akmal, who has struggled to make a persuasive case, would miss out. Australia have kept their tinkering to a minimum particularly when it comes to the batting order. It is unlikely that changes will happen in the final game, though the fast bowlers could see the usual shuffling. The Dubai pitch appeared to have something in it for the slow bowlers as well as the batsmen, though is still far too slow to be conducive to the most enjoyable one-day cricket. Weather will not be a factor, however, as the series takes its bow. Since the start of 2018, Pakistan's record against teams that play the 2019 World Cup reads four wins, 16 losses. One of those wins came in the final over against Afghanistan at the Asia Cup last year. Australia's win in the fourth ODI was just the fourth time in the format's history a side had defended a total scoring centuries.